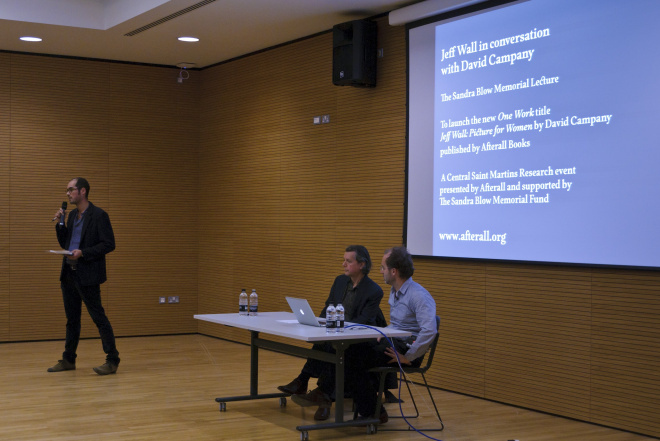 On 23 November 2011, following the recent addition to Afterall’s One Work book series, Jeff Wall: Picture for Women, Afterall and Central Saint Martins Research organised a conversation between Wall and the book’s author, David Campany. Full audio available here. Jeff Wall’s work marks the migration of photography as an art form from the printed page to the gallery wall. His work over the last three decades, mainly through the use of backlit transparencies but also through large and medium-scale prints, has made a key contribution to the development of pictorialism as a technique and an idea. In the conversation, Jeff Wall discussed in depth a small selection of images from his oeuvre with David Campany. Jeff Wall was born in 1946 in Vancouver, Canada, where he lives and works. His work has been the subject of solo exhibitions at the Vancouver Art Gallery, Vancouver (2008), the Museum of Modern Art in New York (2007), Tate Modern, London (2005–06), Schaulager, Basel (2005), the Irish Museum of Modern Art, Dublin (1994) and the Institute of Contemporary Arts, London (1984). 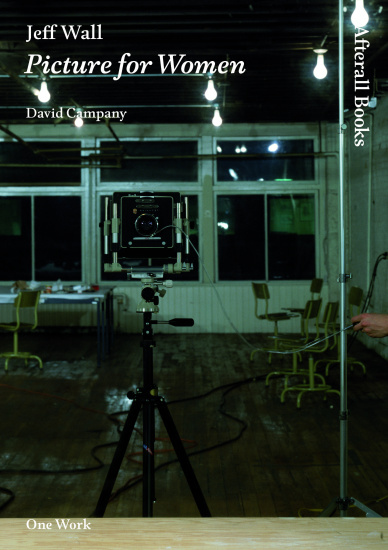 David Campany is a writer, curator and Reader in Photography at the University of Westminster. His books include Art and Photography (Phaidon 2003, reprinted in 2012) and Photography and Cinema (Reaktion, 2008). Last year he co-curated ‘Anonymes: Unnamed America in Photography and Film’ at Le Bal, Paris. This event was the Sandra Blow Memorial Lecture 2011 and an Exhibitions: histories, practices and Image, Performance, Object research event. Jeff Wall: Picture for Women is part of the One Work series, which focuses on artworks that have significantly shaped the way we understand art and its history. David Campany offers an account of Jeff Wall’s move from a Conceptual approach towards an engagement with the idea of a singular (rather than serial) picture. Wall’s Picture for Women is an attempt to relate the spectatorial demands of the 1970s to modernist pictorial art. Following the recent addition to One Work book series, Jeff Wall: Picture for Women, this event sees the artist in conversation with the book's author, David Campany.